The Bushveld atmosphere of the vicinity around the Roodeplaat Dam contributes to it being a haven for outdoor living. With the dam situated a mere 24 km north east of the Pretoria city centre, this is one of the preferred areas for families to live on smallholdings just outside the city, yet being close to city amenities. In addition to some small farms remaining, plus lots of smallholdings of different sizes, the Roodeplaat environs is becoming more and more popular for security villages, township developments and upmarket estates. All of these nestle around the Roodeplaat Dam on the original farms such as Roodeplaat, Kameeldrift, Derdepoort, Kameelfontein, Leeuwfontein, Buffelsdrift, Rynoue and Zeekoegat. But sixty years ago this was a peaceful farming community. By then the original big farms had been subdivided amongst family members into smaller farms of 150-200 morgen each. Everyone had cattle and was farming with wheat, lucerne and /or maize, with vegetables on the side for own consumption. A water-furrow from Baviaanspoort to where the dam wall is today, was the fountain of life for this farming community. In the early 1950’s government decided to build a dam in this area for irrigation purposes, by impounding the Pienaars River, Hartbees Spruit and Edendale Spruit. Originally known as the Pienaars River Dam – and officially opened in 1959 – this concrete arch dam wall was 351 meters long and 55 meters high. When full, the dam has a surface capacity of 403 hectares, keeping 43 472 000 cubic meters of water. Today the irrigation function of the dam is supplemented by a canal system, providing water to the Agricultural Research Council and to farms and smallholdings situated north of the dam wall. 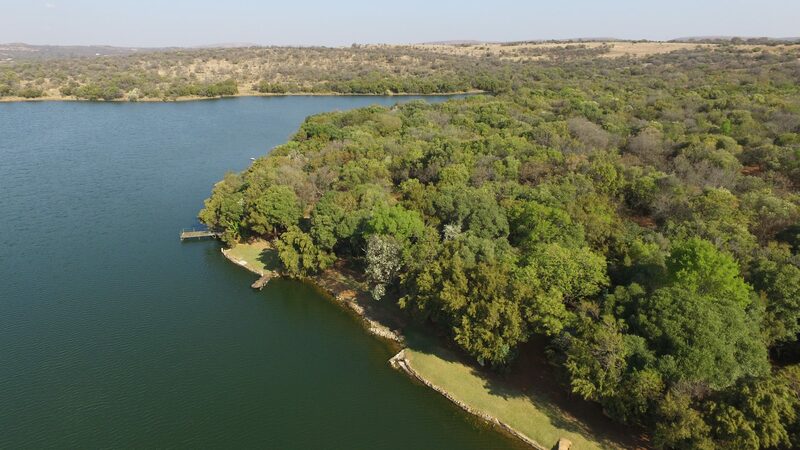 Apart from its original purpose of irrigation for farming, the Roodeplaat dam has in the meantime become an important source for Magalies Water, a state-owned water board that supplies potable water to a large area north of Pretoria. Their water purification works are located at the nearby Wallmansthal and Klipdrift, near Hammanskraal. Two sewage treatment works situated at Baviaanspoort and Zeekoegat also let out treated effluent that flows into the dam, at times giving rise to accusations of contaminating the dam, causing the growth of algae and hyacinths to flare up during the warmer months. The Department of Water Affairs Resource Service is housed near the dam wall from where they monitor and manage the water itself. From the dam wall the water flows northward as the Pienaars River. Unfortunately the public is not allowed to get close to the dam wall any more, thus missing out on the most spectacular site when the dam overflows. Soon after the dam was completed, it started becoming popular for recreational purposes, particularly fishing. Today big parts of the waterside are next to state land where there are facilities for camping, picnicking, fishing and boating/skiing. The Roodeplaat Dam is also worldwide known, and draws thousands of visitors several times a year, for the rowing championships that take place on the 2km stretch of open water. It is here that the South African rowing champions prepare themselves before representing the country at oversees events. Should you be considering giving your family a country lifestyle close to the city, with lots of fresh air, enjoying the pleasant moderate climate of north-of-the-Magalies Mountain….look no further. There are always small farms and smallholdings available in the Roodeplaat neighbourhood that are waiting for new owners….